Republicans in the Wisconsin state Senate rushed to approve 82 of Gov. Scott Walker's appointees, a month after voters chose not to reelect the Republican. The GOP-controlled Legislature has been working with Walker to make sure that the incoming governor and attorney general, who are both Democrats, won't have as much power as their Republican predecessors. They've passed a series of bills in a lame-duck session that amount to nothing less than a brazen partisan power grab, taking responsibilities away from the governor and attorney general and giving them to the heavily gerrymandered Wisconsin Legislature. Walker is expected to sign them in the coming days. 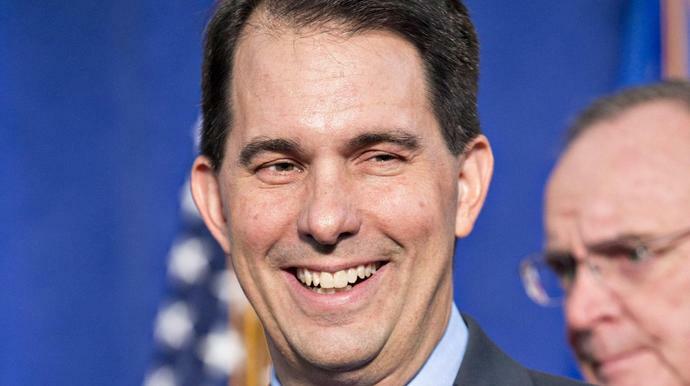 On Tuesday, they also approved 82 Walker appointees to serve across the state government. That's 82 confirmations in one day, just weeks before a new governor, of a different political party, is set to take office. The Milwaukee Journal Sentinel has the full list of these appointees here. The appointees include two members of the board that oversees the state's public universities. One of those positions has been vacant for more than a year, but Walker just nominated his choice this week. He also made one of his top aides, Ellen Nowak, who is currently Department of Administration secretary, the new head of the state Public Service Commission. In a letter to Walker on Tuesday, the incoming governor, Tony Evers, asked the governor to withdraw the names he submitted to the state Senate for approval. "These appointments should be fully vetted in the next legislative biennium," Evers wrote. "Many of them have had no public hearing and some have not filed a statement of economic interest. Given the rushed timing and the fact that many of these appointments have gone unfilled for extended periods of time, I must request that you withdraw this slate of names to allow ample time for full review, not only for the State Senate, but for the people of Wisconsin, too." Carrie Lynch, Evers' spokeswoman, told the Wisconsin State Journal that more than 30 of the nominees have had no public hearing. Walker's office did not immediately return a request for comment on why the governor waited to send so many appointees for consideration until Tuesday. Walker no doubt knows what he did is not a good look. In 2010, he urged outgoing Democratic Gov. Jim Doyle not to "finalize any permanent civil service personnel" during his last two months in office. "In the past, it has been common practice for political appointees to use this time to 'bump down' into permanent civil service positions," Doyle wrote. "I believe these appointees should be required to go through the same application process as any other civil servants and my Administration will review any new permanent hires during the next two months so they can be considered for termination during the probationary period." Walker also recently gave the outgoing attorney general a seat on a court in Waukesha County ― a position that doesn't require state Senate approval. "Wisconsin Republicans intent on invalidating the results of the 2018 election and undermining the orderly transfer of power rushed through a slate of political appointees to reward cronies with jobs and stop our incoming governor from being able to put his team in place, like Scott Walker was able to do," said Mike Browne, the deputy director of the progressive advocacy group One Wisconsin Now. Some of the best high school prospects from across the state are nearing college decisions and our Edgy Tim has the latest on a handful of offers and commitments. Democratic Governor Tony Evers, who took office in January, inherited a deal to give Foxconn around $4 billion in tax breaks and other incentives that was championed by Scott Walker, Evers' Republican predecessor. Announced at a White House ceremony in 2017, Foxconn's 20-million-square-foot campus marked the largest greenfield investment by a foreign-based company in U.S. history and was praised by President Donald Trump as proof of his ability to revive American manufacturing. Foxconn, a major supplier to Apple Inc, has pledged to eventually create 13,000 jobs in Wisconsin, but said earlier this year it had slowed its pace of hiring. Democratic Governor Tony Evers, who took office in January, inherited a deal to give Foxconn around $4 billion in tax breaks and other incentives that was championed by Scott Walker, the state's former Republican governor. Announced at a White House ceremony in 2017, Foxconn's 20-million square foot campus marked the largest greenfield investment by a foreign-based company in U.S. history and was praised by President Donald Trump as proof of his ability to revive American manufacturing. Foxconn, a major supplier to Apple Inc., has pledged to eventually create 13,000 jobs in Wisconsin, but said earlier this year it had slowed its pace of hiring.